وجه العملة السيدة فورتينا ، معصوبة العينين مع عبارة "فن تحويل المعادن الثمينة صنع سويسري من منتوجات pamb الفنان ميتوس بريسيوكس"
السيدة فورتينا ، معصوبة العينين مع عبارة "فن تحويل المعادن الثمينة صنع سويسري من منتوجات pamb الفنان ميتوس بريسيوكس"
1 أوقية سبيكة بلاتينية من مصفاة المنتجات الفنية للمعادن الثمينة السويسرية We’ll assure you the lowest price on the internet, when you order your 1 oz PAMP Suisse platinum bar from our online store today! 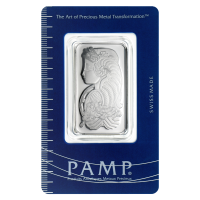 PAMP is a state-of-the-art refinery based in Ticino, Switzerland and, since its founding in 1977, the refinery has made a name for itself as one of the world’s leading producers of bespoke, precious metal bullion bars. The front of the bar features a high relief render of beautiful Lady Fortuna, shown with a cornucopia of treasure in hand and a blindfold on, to indicate the unpredictability of fortune. There are no inscriptions on the front, only a decorative frame, surrounding the majestic main feature. The reverse of the bar features PAMP logo, Suisse title and the bar’s individual certification code. Also on the reverse, details of metal weight, content and purity. These lustrous platinum bars feature Fortuna, considered to be the embodiment of luck and fortune. Increase your own fortune and fortify your portfolio with a 1 oz PAMP Suisse platinum bar today.